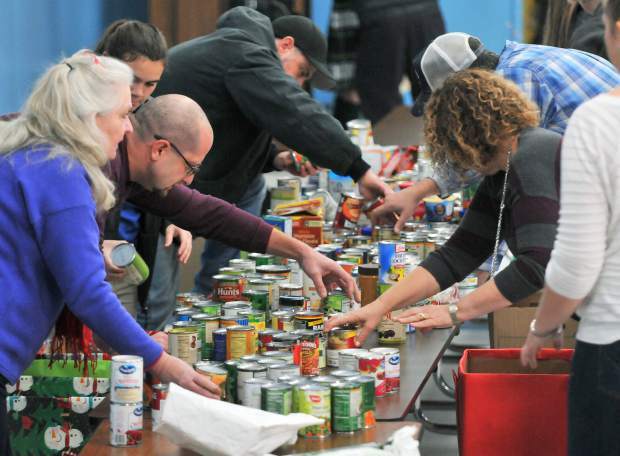 Donation Day organizers help sort donated food Thursday morning at Grass Valley Charter School where area students keep with a century-old tradition of helping Nevada County's needy. The goods, once organized and boxed, were then sent to Interfaith Food Ministry. 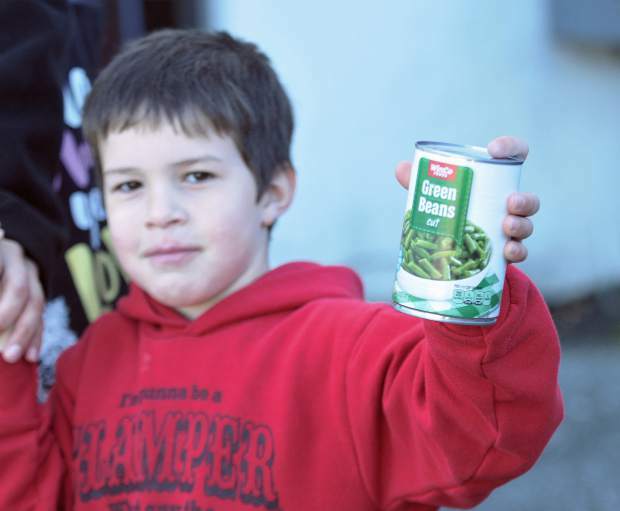 Hunter Webb, 5, holds his can of food proudly before dropping the donation off at Grass Valley Charter School Thursday morning for Donation Day, a 125-year-old tradition of giving in Grass Valley. 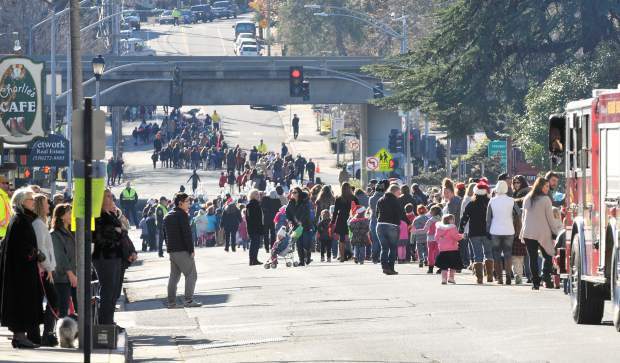 Hundreds of area students and school faculty fill the streets of downtown Grass Valley while collecting donations to be taken to Grass Valley Charter School for the 125-year-old Donation Day tradition. 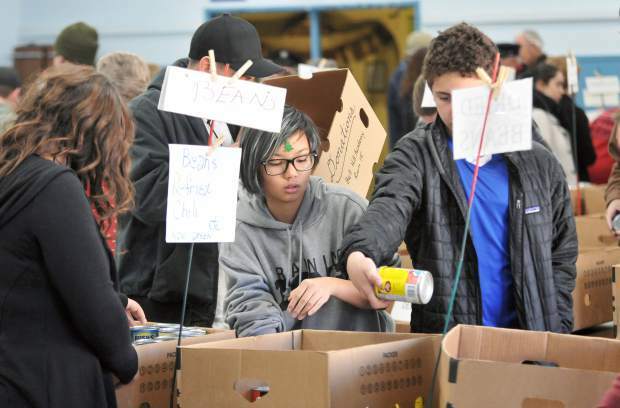 Grass Valley Charter School's Lian Trowbridge (center) helps sort the thousands of donated canned goods Thursday morning along with a group of other school volunteers. Members of the Lyman Gilmore Marching Band led Thursday's Donation Day and played festive holiday tunes. 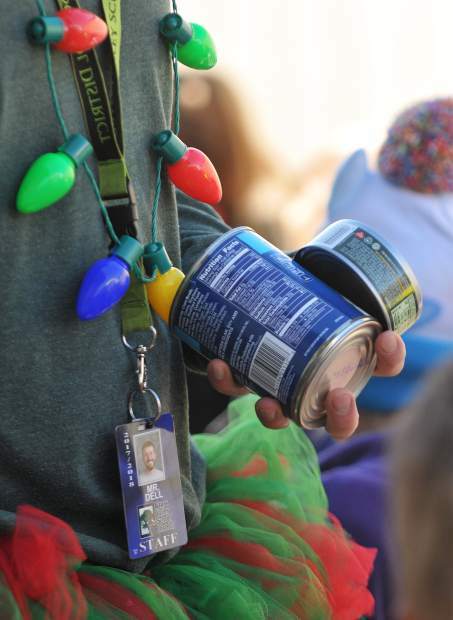 A Deer Creek Elementary School faculty member carries a handful of canned goods towards Grass Valley Charter School during Thursday's Donation Day parade. Three sticks and three potatoes sit among the other food items donated during Thursday's Donation Day. 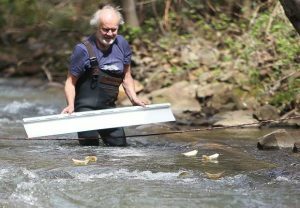 The potato/stick tradition dates back to when Donation Day was first incepted in 1883 after the closing of the Eureka Mine that left many miners without work. 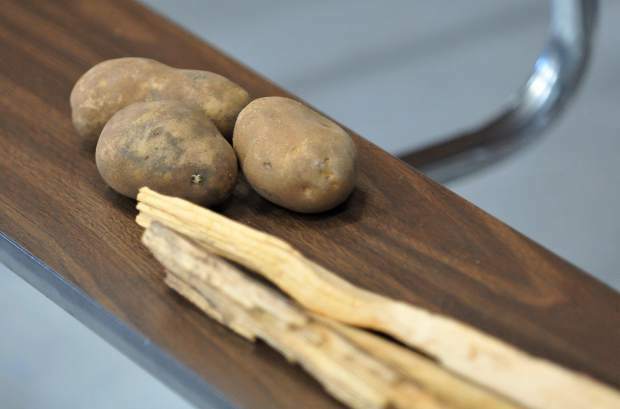 It was proposed that if every student brought a potato and a stick to burn in the fire, that everyone would be fed for the holidays. 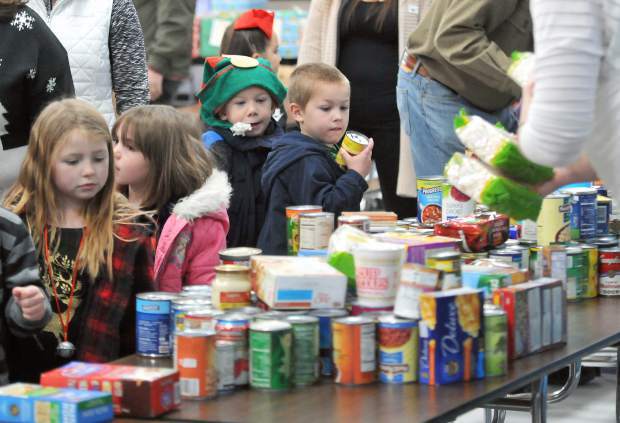 Area school children place their canned goods on a table at Grass Valley Charter School where donations for Donation Day were collected. Volunteers from the Ladies Relief Society, FFA, Nevada County Probation Dept. 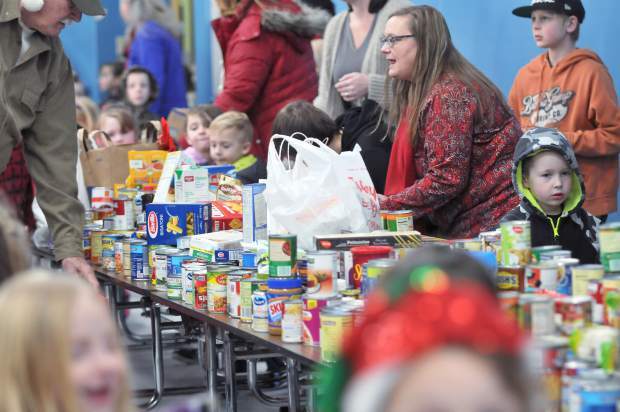 and Grass Valley Charter School work to quickly sort the thousands of donated food items Thursday inside the multi purpose room at Grass Valley Charter. 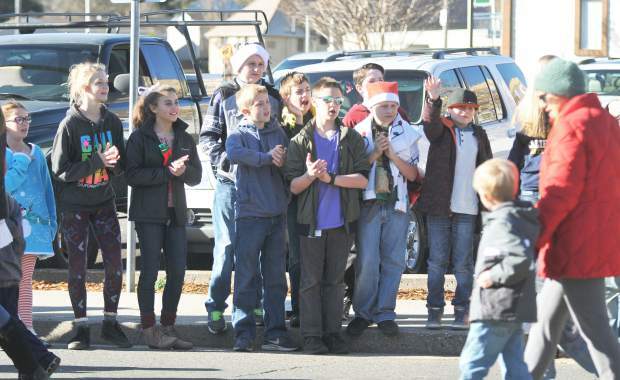 Area youth cheer on the young school children participating in this year's Donation Day along South Auburn Street Thursday morning. Students from five area elementary schools file into the halls of Grass Valley Charter School to drop off their donations of canned goods. A youngster hauls in a compressed fire log during Thursday's Donation Day. 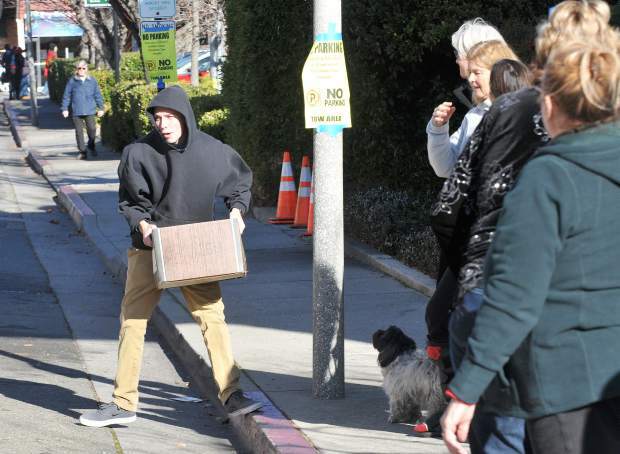 A member of the Donation Day parade picks up a box of canned food being donated by the parade's spectators. 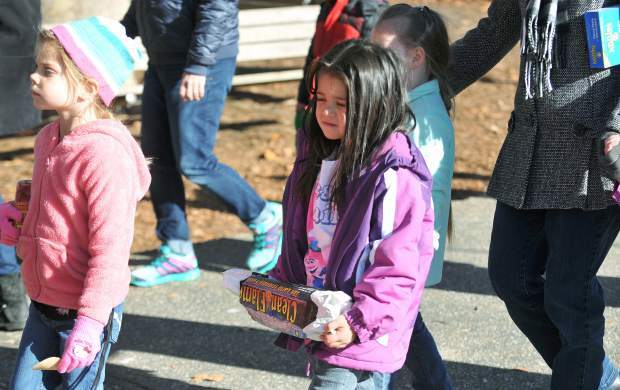 In a tradition that has brought holiday cheer to the needy for more than 125 years, hundreds of Nevada County schoolchildren, many clutching cans of food, paraded through downtown Grass Valley Thursday morning. 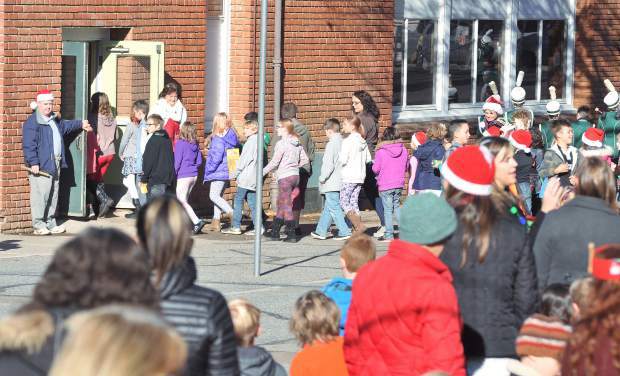 Students from Scotten Elementary, Deer Creek Elementary, Bell Hill Academy, Grass Valley Charter and Mount St. Mary’s took to the streets, starting at the steps of the charter school (the former Hennessy School), up Neal Street to Mill Street and then down South Auburn Street back to the school. The parade participants, decked out in a variety of holiday-themed garb, were accompanied by the Lyman Gilmore School band, a color guard and bagpipers, with a fire truck bringing up the rear. Back at the school, a remarkably efficient assembly line funneled the kids, parents and teachers into a room where they dropped off their donations on long rows of tables. 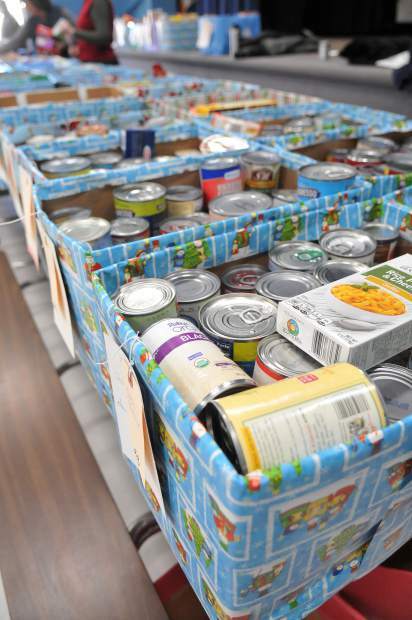 The food items were swiftly sorted and packed by members of the Grass Valley Ladies Relief Society, as well as volunteers from FFA and Nevada County Probation Department, into boxes that will make their way to Interfaith Food Ministry. Donation Day, which is hosted by the relief society, began in 1883, after the editor of The Union newspaper received a letter from Caroline Meade Hansen. That year, the large Eureka Mine and several smaller mines were forced to close, leaving many miners out of work. The Grass Valley Ladies Relief Society was swamped with requests for assistance, and as Christmas neared, the treasury was nearing bottom. 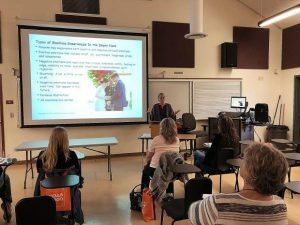 Knowing of the community’s plight, Hansen proposed each school child could bring a stick of wood and a potato to school, and she recommended the society as the perfect group to collect and distribute the wood and potatoes to those in need. Donation Day soon grew to become an annual holiday observance and city merchants jumped on the bandwagon, contributing hams, sacks of flour and other goods. In 1889, the owner of a butcher shop suggested the students march through town with their firewood and potatoes, collecting bounty from merchants and townsfolk as they went. The annual Donation Day parade was born, and has been a yearly event ever since. The students have traded sticks and potatoes for cans of corn and beans, but the message remains the same — encouraging students to think about those who are less fortunate and to understand that anyone can do something small to help. In years past, society president Pamela Meek explained, volunteers would sort the food into boxes for 150 families. “The whole room was full of boxes stacked two and three deep,” she said; the families then would come by that afternoon to pick them up. But inevitably, some of the families would fail to show. This is the third year the relief society has donated the bulk of the food to IFM, said past president Debbie Luckinbill. “The partnership has been so advantageous,” she said. “Our referrals from the school district have gone down, which means people are getting food continuously” instead of just once a year. The relief society does still assemble boxes for families in the Washington area, and the volunteers try to pack each box with a variety of items, Meek said. 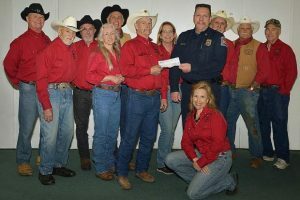 Some of those donated food items were siphoned off into individualized and gaily wrapped food boxes for 53 needy families, which were picked up by Nevada County Sheriff’s Office volunteers and were being delivered, along with Toys for Tots gifts. In memory of their daughter, Cindy and Bill Cara always bring all the fixings for green bean casserole along with a copy of the recipe, Meek said. 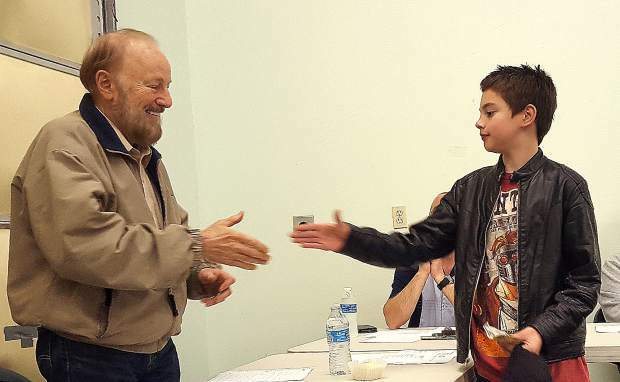 Other donations came in this year from Union Hill School and even from Alta Sierra, Meek said. Last year, it rained, so Grass Valley Charter School students paraded through the school’s halls singing Christmas carols while members of the Marine Corps Color Guard, the Ladies Relief Society, the Rough and Ready Volunteer Fire Department and Nevada Union High’s FFA program walked through downtown seeking merchant donations. This year marked a date change for the parade, which might have increased the turnout. 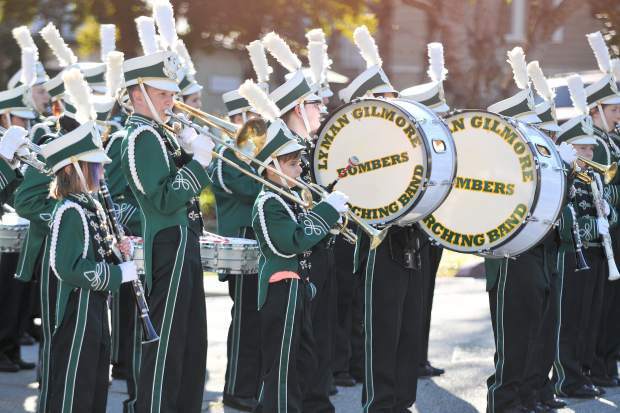 The Donation Day Parade had been held for years on the last Friday before winter break. But some students then would not show up for school the following week, Meek said — so the decision was made to hold the parade on the actual last day.